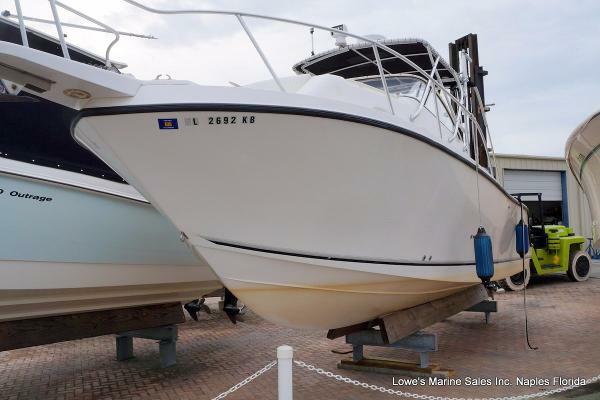 1993 Mako 293 Walk Around Yamaha F-250's DON'T MISS YOUR CHANCE TO BUY THIS "TOURNAMENT SERIES" GREAT RIDING, UNSINKABLE, WALKAROUND WITH UPGRADED YAMAHA FOUR STROKE POWER! ALL SERVICE RECEIPTS AVAILABLE AND THE TRAILER AND ENGINES WERE RECENTLY SERVICED. The Mako 293 Walkaround (called the 263 in 1993-94) is a big walkaround cuddy with just about every feature an angler could ask for on a boat this size. She's built on a deep-V hull with a solid fiberglass bottom and cored hull sides and there's enough foam packed into the hull to provide positive flotation. The deck layout boasts a full-height transom with a built in livewell, shower, transom door, and two storage bins. There are tow big fishboxes in the cockpit sole and and tackle drawers are located behind the helm and companion seats. Rod storage is under the gunnels. The side decks are wide, deep, and well secured, and bench seating is built into the forward cabin trunk. Below, the Mako's roomy mid-cabin floorplan sleeps four and includes a full galley, high-low dinette table, and an enclosed head with shower. Additional features include an elevated helm station, dive platform, recessed trim tabs, teak cabin sole, molded bow pulpit, and anchor locker. 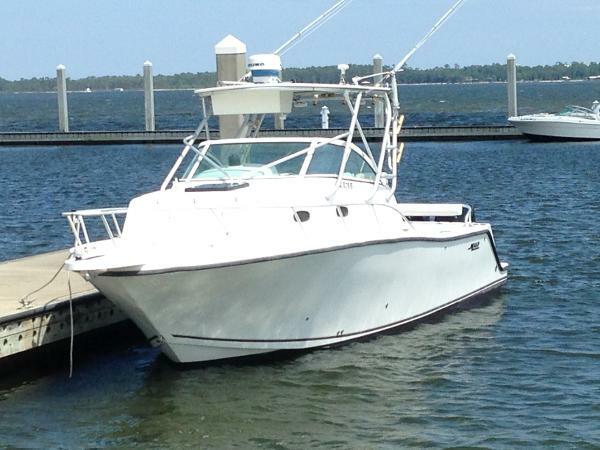 1998 Mako 293 Walk Around 1998 Mako 293 Walkaround with Twin 2015 Mercury 250 Verado outboards. Only 146 hours. Engines come with Digital controls and Smartcraft gauges. 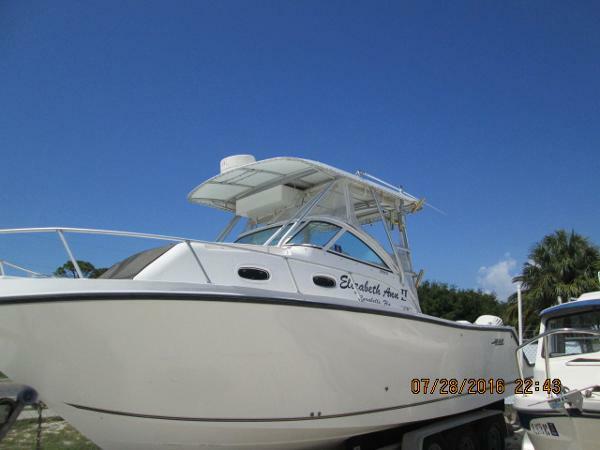 Key features include Hardtop with outrigger mounts, Aft bimini top, New Simrad large screen color GPS/ Fishfinder/ Radar, VHF Radio, remote spotlight, underwater LED Lights, trim tabs.. Cabin has a mid berth, galley, stand up marine head, Flatscreen TV. Marina Stored, no trailer. 2000 Mako 293 Walk Around 2000 year model Mako 293 Walk around Cuddy Cabin. This boat is on a Loadmaster aluminum Trailer and has 2000 model Evinrude 225HP 2 strokes with approximately 800 hours. The electronics include JRC 1500 Mk2 Radar, Raymarine Autopilot, 2 Furuno GPSs, Furuno FCV600L Sounder, 2 VHF Radios, Fuel Management and AM FM CD. 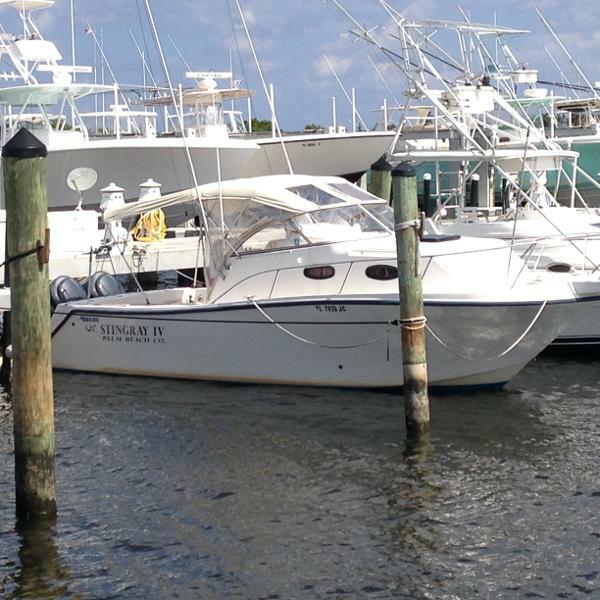 This boat has a comfortable cuddy cabin with enclosed marine head. 2000 Mako 293 Walk Around This boat was re-powered in 2006. Has AC but no on-board generator.